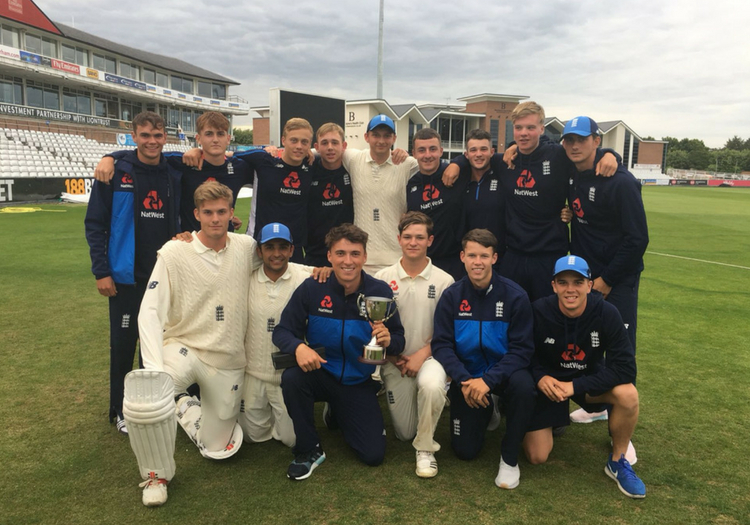 England Under-19s produced a brilliant performance to clinch their series against South Africa by winning the second "Test" by four wickets at Emirates Riverside. The home side were bowled out for 133 in their first innings, trailing the Proteas by a sizable margin. However, the bowlers responded as Adam Finch led the way with four wickets, while Jack Plom and Sam Connors struck twice to dismiss the tourists for 90. There was still work ahead for the batsmen to chase down 167 to win the contest. Early wickets put the pressure on the middle order, but contributions from Tom Banton, Jack Haynes, George Lavelle, Harrison Ward and Jack Davies allowed England to seal the win to secure the Test series. England resumed day three on 121 for nine, and Finch found the boundary on a couple of occasions. However, the innings was ended when Sam Connors was caught behind off the bowling of Gideon Peters, with the home side still 76 runs behind. The Proteas made a solid start to their innings, taking their lead beyond 100 runs before Plom produced a brilliant over to bring the home side back into contention. First the Essex seamer produced a brilliant delivery to remove Joshua Richards' middle stump. Louis van Schalk fell first ball courtesy of a suicidal run out as Plom had time to run to the stumps and whip the bails off at the keeper's end. The collapse continued as Wandile Makwetu edged behind to Davies to hand England their third wicket in three balls. The bowlers kept the pressure on the Proteas and Connors claimed his first strike when Jacob Miltz was caught behind. South Africa lost their fifth wicket on the stroke of lunch when Sinethemba Qeshile attempted to sweep Ward, but missed the connection and was out lbw for 14. After lunch, Connors returned from the Lumley End and nipped one back off the seam to pin Jason Niemand, putting the pressure on the tail. Finch came into the attack to remove Jade de Klerk, who was caught by Lavelle. His dismissal sparked a collapse in the innings as the Worcestershire bowler wrapped up the tail cheaply. Thando Ntini was the first to fall before Mondli Khumalo and Kgaudisa Molefe were out in within the space of four deliveries. England's reply got off to the worst possible start in their chase of 167. Ntini clean bowled Ollie Robinson in the second over, while Ben Charlesworth followed his opening partner back to the pavilion for four as Gideon Peters produced a good delivery. Skipper Banton turned the momentum back in his side's favour, hitting 17 off a Peters' over before the tea break. Banton continued to make progress, but was then out lbw attempting a reverse sweep off Molefe, ending a stand worth 61 with Haynes. Ntini returned for a second spell from the Lumley End and in his fifth over he removed Haynes, who was caught behind for 27. Lavelle upped the ante with five boundaries to try to put the pressure back on the tourists. However, his dismissal for 25 to Khumalo offered a South Africa hope of snatching the victory. Ward and Davies held their composure to reach their 50 partnership off 126 balls, and although Ward fell to Peters, England were still able to close out the victory.